Neist Point is a popular viewpoint on the most westerly point of Skye. Neist Point Lighthouse has been located there since 1909. 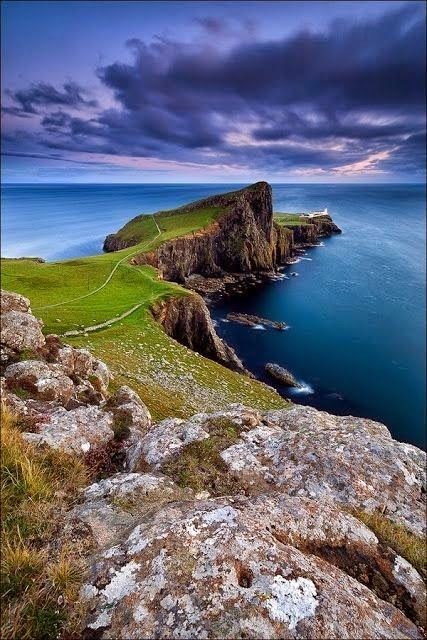 Neist Point is the most westerly point on the Duirinish peninsula on the Isle of Skye. It projects into The Minch and provides a popular walk and viewpoint. Basalt at Neist Point is very similar to that at the Giant's Causeway in Northern Ireland. A steep path leads down from the road. It is a good place to see whales, dolphins, porpoises and basking shark. Common sea-birds include Gannets, Black Guillemots, Razorbills and European Shags. Several rare plants, including saxifrages are found on the point.